Balaram - Wielder of the plough. Qualities -Protection and loyalty, brotherly love and service, Spiritual and moral strength, freedom from the evils of intoxication. Ramakrishnananda?s hand rolled incense is made out of the finest natural ingredients in the world. We have chosen a variety of herbs, flowers and resins, blending them together with pure oils and pure sandalwood, creating 18 exquisite blends suitable for a variety of different atmospheres and different moods. Ramakrishnananda?s hand rolled incense is made out of the finest natural ingredients in the world. We have chosen a variety of herbs, flowers and resins, blending them together with pure oils and pure sandalwood, creating 18 exquisite blends suitable for a variety of different atmospheres and different moods. 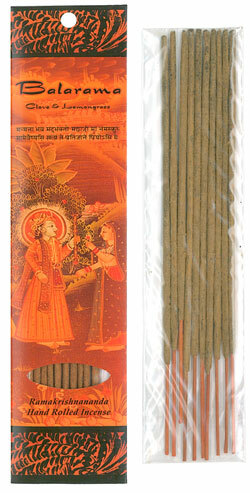 Our incense is made by hand and each stick is rolled individually. These unique ayurvedic blends are made according to ancient recipes and every incense blend represents a combination of several scents that mingle together in harmony. The incense will burn for a long time and will linger for hours after burning. They are designed to create a soothing and balanced environment, in which relaxation of the body, mind, and spirit can occur.